Last week, my Merrimack students were each exploring a different digital tool and reporting on it in their blogs. You can find their blogs here. Some I was familiar with, like Trell0, Flipboard, Slack and Canvas. Others were new to me, including Genially, Adobe Spark, and Google Keep. Between the posts and the comments, we all learned new things. Hat tip to Laura Gogia for providing additional information on Genially via a tweet. Yet, my “tool” moment came not from my students, but from an unexpected loss of a tool during the week. 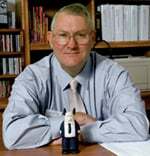 I am currently teaching three courses – a doctoral course at Creighton, a Masters course at Northeastern, and a certificate course at Merrimack. I typically spend much of Thursday evening through Sunday evening engaging with these different courses. So Friday is typically a busy time for me. As I engage with students either through LMS discussions or through blog comments, I often pull up resources I have previously tagged in Diigo. For twelve years, social bookmarking has been my digital brain…and Diigo has been my go-t0 platform for the past ten years. If I save one more bookmark, I will have tagged 7,777 websites using over a thousand tags! No worries…it would be back shortly. 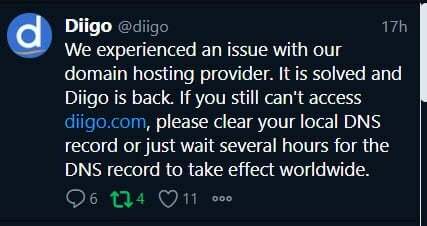 Anyone on #edtech know what’s happened to #diigo ? Hacked? Closed down? Been off all day. So all day Friday, I had to find resources to back up my class comments without the use of Diigo. I did it…but it was not as fun! 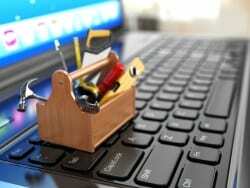 One does not realize how often one uses a tool until that tool suddenly is not available. My first action once it came back was to download my bookmarks in both CVS and HTML…but with 7,000+ links, neither is very user friendly. Still, I have them if Diigo goes away again. …I mentioned in another post that I feel like I have tried numerous products and they are all “great” until they aren’t, and I find a new shiny app to try. Like you, I get accused (mainly by younger family members) of not responding fast enough to texts – which grates against me a little – until I realize that their need for instant responses is just that – theirs. Have also started to look at Trello a little bit, as another member of our class is looking at it. Might also be a good fit for my needs – there I go again! New and shiny…..
“…They are all “great” until they aren’t…” – that may be the lesson! What Diigo has provided to me for a decade is organization of the web. That is still handy..but this 9+ hour outage has me thinking about alternatives. I would be interested in any suggestions those that read me might have! Is there something new and shiny out there that can organize my tags in a new way? I went to Pinboard a number of years back. It was after a similar scare with Delicious (and increasing frustration with changes they were making). I back it up to Diigo through some IFTTT recipe. My next move will likely be to using a WordPress install that I host.